This walk: 2015-7-1. Prewley Moor Ice Works, Sourton Tors, triangulation pillar, thufurs (correct), pony, Meldon Reservoir, Lake Viaduct, So/B boundary stone, long boundary ditch, dew pond, apple crusher, Greep Quarry, cotton grass, Water Treatment Works. Approaching the Ice Works through the front entrance - in fact, the only entrance? Looking up the approach into where the ice store used to be. Google Earth image: there appear to be five long reservoirs and a short one (marked by the mapping pin). The pit area with remains of building structures is approximately in the centre of the image with a long pile of spoil earth leading just east of north and the old approach track going out towards the top-left. A torn around panorama of the ice works site. Sourton Tors, SX 543 898, elevation 440 metres (1443 feet), known as East Tor locally because that is where it is, from Sourton! A rockworm nest? Any guesses? There was a fair view of the surrounding countryside. Concentrating on the pony - tending towards a Palomino-type with a white blaze (Palomino images). Unknown relict, possibly a tinners trial pit? AHA! We know what these are now, don't we?! Thufurs, indicating that Dartmoor was certainly periglacial during one era in the past, suffering seasonal frost soil cryoturbation at the end of the last ice age. Encyclopaedia.com definition.. Standing near the head of Deep Valley, also known as Withecombe Bottom. Zoomed view to Lake Viaduct (Youtube movie). At the southern end of the deep boundary ditch and reave at the head of Deep Valley stands a boundstone inscribed �B/So�, the stone and ditch marking the boundary between Bridestowe and Sourton Commons, the land to the east shared by both parishes, that to the west being the preserve of Sourton only. North of this point, the area of land encompassed by the ditch (P460) and the modern parish boundary line is known as The Triangle, an area rescinded to Okehampton parish following a boundary dispute at a now unknown period prior to the mid nineteenth century. It has been suggested that the boundstone here marks the former site of Iron Gates, or Iron Catch Gate, itself a former bondmark of the parishes, but the true location of the gate is disputed (q.v. grid square 5490)." Source: Mike Brown's CDROM "Guide to Dartmoor", 2001. Dew pond and Sourton Tors. Section of the deep boundary ditch. Apple crushers at SX 54642 89599, half, damaged. It is said that they were always made in two halves, is that correct? Another section of the deep boundary ditch: whoever dug this did a lot of work. Stone from the quarry was used to build Sourton vicarage, the Wesleyan Chapel and other Victorian buildings. Another view into the quarry. Zoomed view to Meldaon Dam, built 1972. Another claimed site for Iron gate - at least it appears to be a gatepost. Iron Gate is claimed to be at several locations in this area, the King Way. 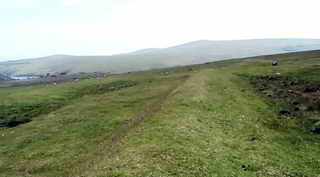 This was a 15� mile track between Tavistock and Okehampton. In 1720, a regular post boy route was established to carry "the King's Posts" from London to Plymouth. Source: "Track 11: The King Way" in Eric Hemery (1986), Walking Dartmoor's Ancient Tracks: A guide to 28 routes, Robert Hale, London, pp. 123-140. A form of creeping "buttercup" with leaves superficially like pine-needles! One of the bog cottons or cotton grasses: either Common cotton grass,Eriophorum angustifolium, with several seed heads, or Hare's tail cotton grass, Eriophorum vaginatum, with a single seed head. This flower looks a lot like wood sorrel, Oxalis acetosella, but in a bog situation? © Crown copyright and database rights 2015. Ordnance Survey. Licence number 100047373. Use of this data is subject to terms and conditions. Also, Copyright © 2005, Memory-Map Europe, with permission. 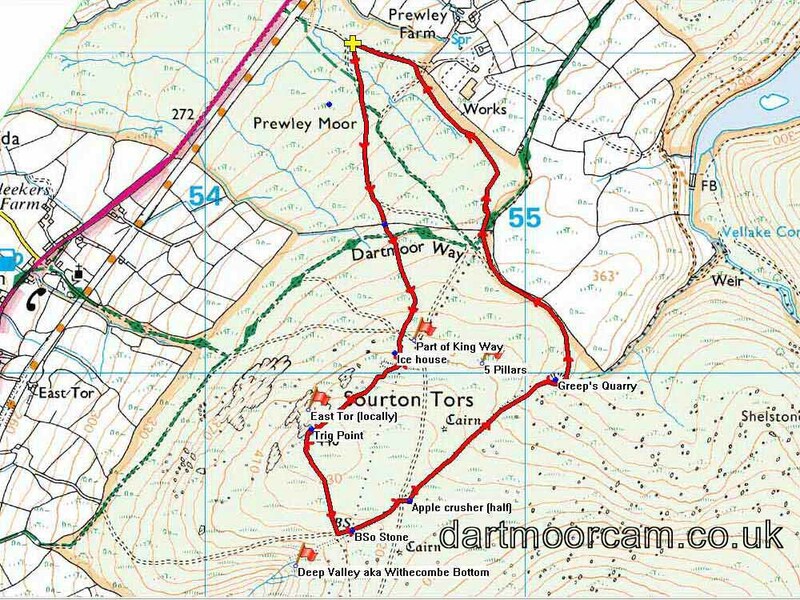 This walk was reached from the A386 after passing through Sourton, towards Okehampton, and turning right at the next opportunity before end of the straight stretch of road at a brown tourist sign (on the left, opposite the turning) for the "Granite Way" and parking beside this road, marked by the yellow cross on the map. Distance - 4.33 km / 2.69 miles.